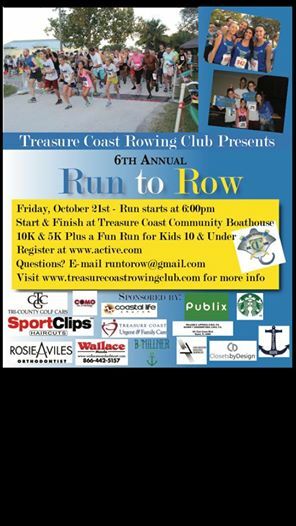 The Run to Row is a 5/10K and Fun Race that leads participants through the old Palm City streets and over the Veterans Memorial Bridge. Because this is a club sport, the Juniors do not receive funding from the state or from the Martin County or St. Lucie School Districts. Fund raising is essential for the success of the program, and we need help from local organizations that will contribute to the quality and success of the program. This run will take you through Palm City along the beautiful St. Lucie River. It begins at 6:00pm. The 5k is a fast flat course suitable for all levels of running. The 10k takes runners over the Veterans Memorial Bridge which offers fantastic views of the waterways where our rowers train. This is a great night time event. All finishers receive medals and the fun runners get a prize too. Parking is available at Leighton Park and certain businesses. Volunteers will be there to assist. Post event refreshments will be served. There will be two water stops. It may get dark so you may consider a headlamp or flashlight. Shirts and bags guaranteed for first 150 people. Contact runtorow@gmail.com for more information.